Now, I'm no expert on the subject of "Eating", but I do consider myself an enthusiastic and reasonably well informed layman. I would suggest that eating without a mouth and stomach is kinda difficult? 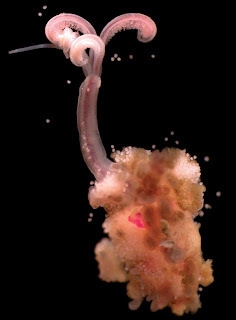 Obviously the Boneworm has that covered and, with a little help from millions of tiny friends, they are able to get to the kind of food that usually requires jaws of steel. They were first discovered in this ghoulish act in 2002, feasting on the skeletal carcass of a whale that had sunk to a depth of 3,000 metres (9,840 ft). What they really want are the fats and proteins that can be found therein. It's in particularly great abundance in whales, since many of their bones are honeycombed and full of fat to help with buoyancy. Also they're proper massive. To reach this loot Boneworms use what are effectively roots. These bore into the bone and branch out at the marrow. Once there, bacteria housed in the roots are able to digest the niceness and pass on some of the flavour to their landlords. 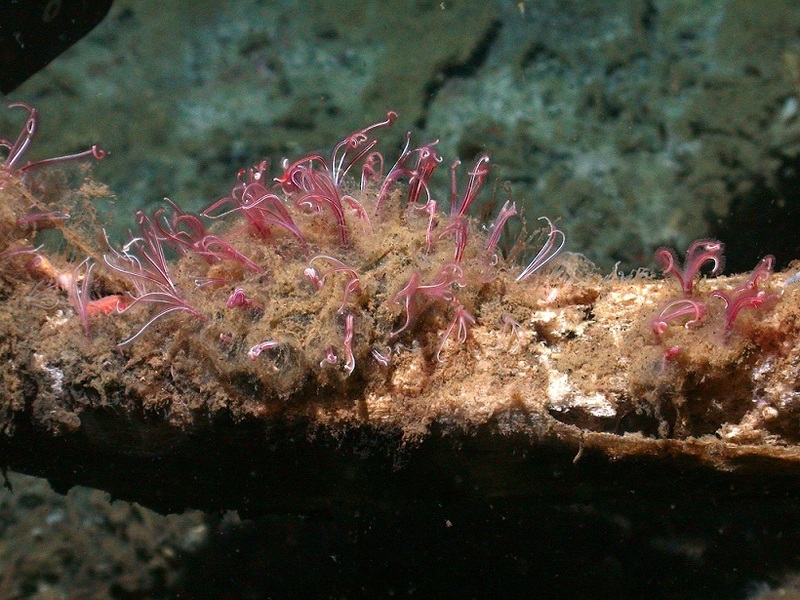 In return, the Boneworm obviously does all that boring work to reach the food and it also provides oxygen. For while one end delves into the remains of some dead thing, the other end has red plumes waving in the current and serving as gills. It's like a macabre, underwater meadow. 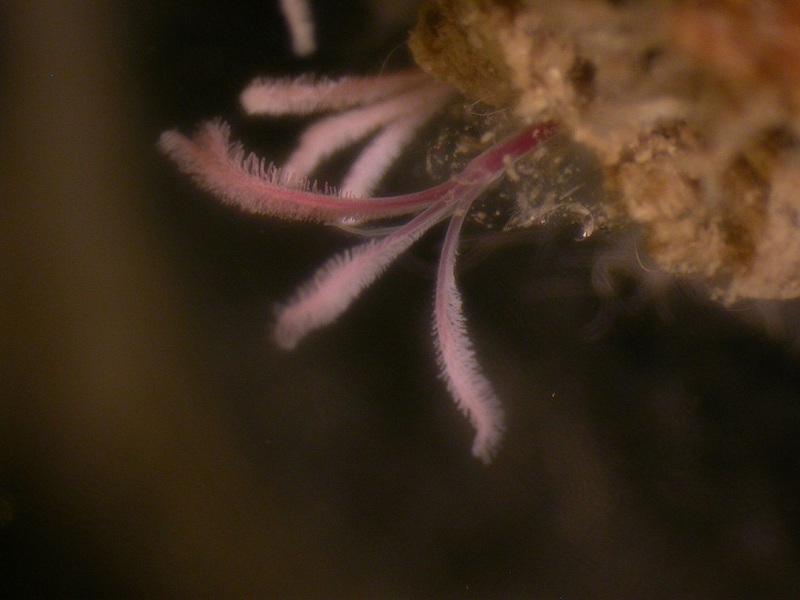 Which is probably why one species of Boneworm is known as Osedax mucofloris - the Bone-eating Snot Flower. Charming. Inside the body of these bone ladies may be 100 tiny males, each 1 mm (0.04 in) long at most. To make matters worse/weirder/BETTER, these males are still attached to yolk sacs! They're actually still larvae, but they are producing sperm nonetheless. Outrageous! Won't someone think of the children?? The reason for this perversion isn't sheer perversion. I don't think so, anyway. It's a consequence of the fragile existence of the Boneworm. Down there in the deep, dark depths, seeking out the skeleton of some corpse that has managed to reach the bottom of the sea, feeding off the bones until there's nothing left and then promptly dying. They just don't have the time to seek out love and commitment. Instead, they reproduce continuously until there's no tomorrow. 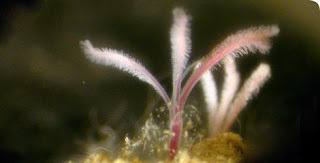 Eggs and larvae must travel the currents in the hope of stumbling across an oasis of something edible. They don't even contain the necessary bacteria at first, they have to acquire them later. It appears that this endless reproduction has given rise to numerous species. There are different species at different depths, including one discovered at just 120 metres (400 feet) deep. Some arrive early to corpses and may bore closer to the surface. Others arrive later but survive longer by digging deep into the bone. Boneworms can only be seen if you chance upon a body in the sea, or chance upon a body on land, put it in the sea and watch. This difficulty means they've only been found thus far near California, Sweden and Japan. But, armed with all their wonderful gizmos, MBARI have discovered 15 species off the coast of California alone. It seems likely that there are huge numbers of Boneworms all over the place. Perhaps the entire ocean is one, big field of Snot Flowers awaiting their time in the corpse. @TexWisGirl: I know... could be meant affectionately, though! @Simsmac: Haha! That's great! Always nice to see a monster hit the big time! I know :( Reality often disappoints, that's why I usually avoid it.